Aurora Villa is a five-bedroom house perfect for families with children over the age of ten, or three couples vacationing together. There’s innumerable flower varieties, a gazebo, a pool, and even an on-site tennis area. The house is staffed with a cook and a laundress, and guests have access to a private cabana on the beach. You may also have small, furry visitors in the mornings - the local monkeys! Two acres of beautiful landscaped grounds! Aurora Villa is between Sandy Lane and Paynes Bay’s beaches. This elegant home has a full staff, an alarm system, and WiFi throughout. Aurora comes alive at sunset, and is bordered by two acres of well-manicured gardens. 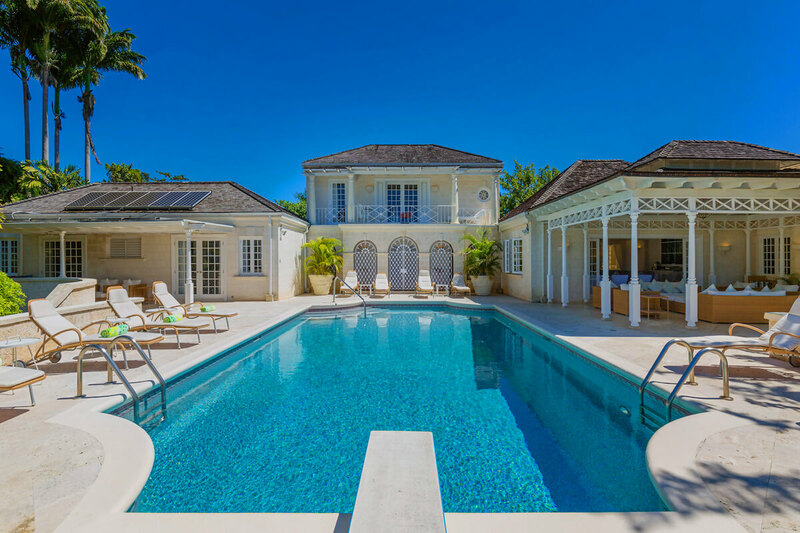 Its panoramic views capture Sandy Lane Estate and the Caribbean Sea. Aurora also has its own flood-lit tennis court and a small gym. A Grecian infinity pool stretches down the middle of the deck, and the covered veranda has informal seating, dining, and gorgeous views. The veranda stretches inside, where there are several lounging spots amongst the chic decor. The air-conditioned media room has space to watch movies, read, or snooze. The kitchen is attached to the media room and has stainless steel appliances and a private cook. All six of Aurora’s bedrooms feature ensuite bathrooms, air-conditioning, and ceiling fans. Two suites have a king bed, and three suites have two twins that can be made up as kings. The sixth suite has a queen bed. There’s also a powder room with a shower off the common area. A cook, laundress, housekeeper, and security maintain the home. Aurora’s guests have full access to the Sandy Lane Property Owners Beach Club. Green Monkey Golf Course is also nearby. Rental includes private cabana on the exclusive Sandy Lane Beach. Cabana on the exclusive Sandy Lane Beach.